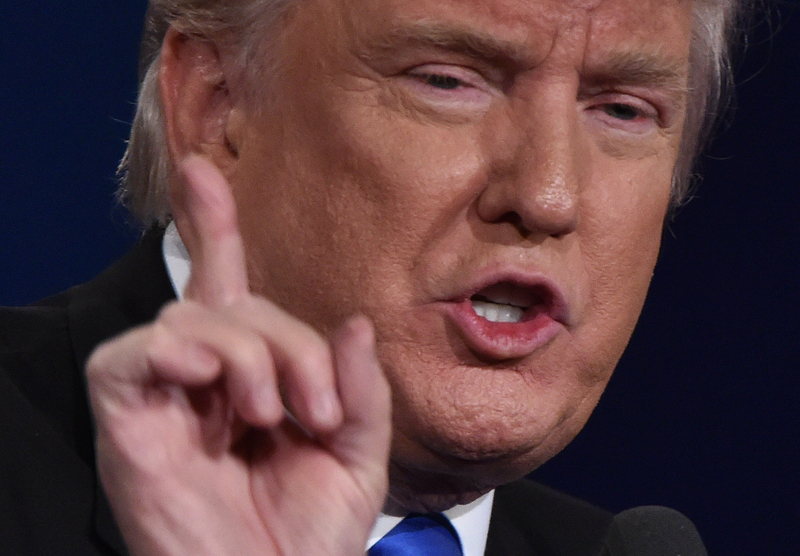 Republican presidential nominee Donald Trump has been described as having the temperament of a toddler before, but after watching Monday night's debate, I think that may be selling toddlers short. After moderator Lester Holt called for the final question of the night, the GOP nominee felt that he needed to defend himself against the accusation that he was unfair to women... so, Trump reiterated his opinion that Rosie O'Donnell somehow"deserved" to be called a fat pig. Yep, that happened, because it's the 2016 election so why wouldn't it? Trump's latest attack on the comedian came as Clinton reminded voters of her opponent's track record with women, a point she has been driving home in recent campaign advertisements. Shortly after Trump backtracked on his previous remark that it wasn't Clinton's "looks" but her "stamina" that kept her from being presidential, Clinton fired back by listing the many insults he's hurled at women over the years. Trump responded exactly as she probably hoped he would. "...[T]his is a man who has called women pigs, slobs, and dogs," Clinton said. "And someone who has said pregnancy is an inconvenience to employers...."
It was then that Trump interrupted her, pulling that classic "I never said that" line straight from the toddler's mouth. He went on to word-vomit some talking points about Clinton's "negative" attack ads, calling them "inappropriate" and "not nice." "...Rosie O'Donnell, I said some very tough things to her. And I think everybody would agree that she deserves it and nobody feels sorry for her." Though this is likely the largest platform Trump has ever had to ridicule O'Donnell, it certainly isn't the first time he's done so. According to a report from The Week, the GOP nominee's insults began all the way back in 2011. He's managed to write or retweet a grand total of 56 tweets about O'Donnell since then. In fact, Trump has tweeted about the comedian more frequently than his own wife, Melania. The fact that Trump doubled down on his years-long feud with O'Donnell on a presidential debate stage is absurd to the extreme. But the fact that he managed to take Clinton's bait and go so ridiculously off-message that he said O'Donnell "deserved" his sexist commentary just seems to be par for the course in Trump's reality. Who knows, maybe next time he'll use the debate stage to spout off his alleged belief that all women are gold-diggers.